Aussies can now enjoy guilt-free showers during the summer with a new shower nozzle that consumes up to 50 percent less water via a technology that uses air to maintain the full-pressure. 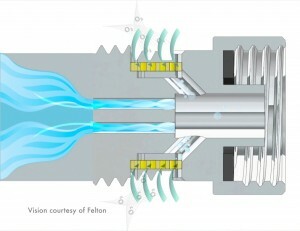 The Commonwealth Scientific and Industrial Research Organization (CSIRO), in collaboration with New Zealand company Felton, has developed the Oxijet nozzle. In an article on CSIRO’s website, Dr. Jie Wu, a fluid specialist at CSIRO, says Oxijet feels just as wet and strong as a full flow shower, but uses a much lesser amount of water. He also differentiates the innovation from traditional ‘low flow’ devices. “Traditional flow restrictors reduce flow and pressure, whereas Oxijet uses the flow energy to draw air into the water stream, making the water droplets hollow,” Dr. Wu said. The science of Oxijet involves the expansion of the volume of the shower stream. With the Australian states currently under water restrictions and efficiency protocols, water usage in households are lessening, but the prices are still going up, according to the Australian Bureau of Statistics. Oxijet will be able to provide a cost effective way to decrease consumption of water in households without sacrificing the comfort of a relaxing shower. “…meaning you can save the same amount of water, while still enjoying your shower,” says Dr. Wu. Novotel Northbeach in Wollongong is one of the first establishments to try Oxijet and the plan to have it installed throughout the entire hotel speaks of its success among their customers. “With over 200 rooms we go through over 10 million litres of water per year, so any saving we can make is very important. We’ve found our customers prefer Oxijet over other ‘low flow’ shower heads, because it gives the illusion of full water pressure,” Mr Walter Immoos, General Manager of Novotel Northbeach said. Meanwhile, Roger Marty, General Manager of Felton, commended CSIRO’s expertise in the development of Oxijet. “The concept of using an aerated showerhead to save water is not new, but the technology behind our device using an aerator insert allows the device to work with existing showers already installed. Our engineers worked with Dr Wu’s team to turn the concept into an inexpensive, quality product,” he said. Oxijet has already been accredited by the Australian Watermark and Water Efficiency and Labelling Standards. It fits most existing showerheads and is now available for purchase in Australia.